Here in the West Texas/Eastern New Mexico region, we have a summertime tradition. We wait all year for it and when the weekend comes, we can smell it in the air. On every supermarket corner, there they are: green chiles, rotating in a huge, iron roaster over a fire, filling the air with the sweet and savory charred smell of heaven on earth. A couple weekends ago, it was Chile Roasting Day. It only happens for a couple weekends at the end of the summer or the beginning of the fall season, so there’s a sense of urgency to buy as many bags as we can before they’re gone. There’s just one problem: letting them go to waste (they’ll mold within a couple weeks in your fridge) or freezing them, which takes away some of their magic, if you ask me. 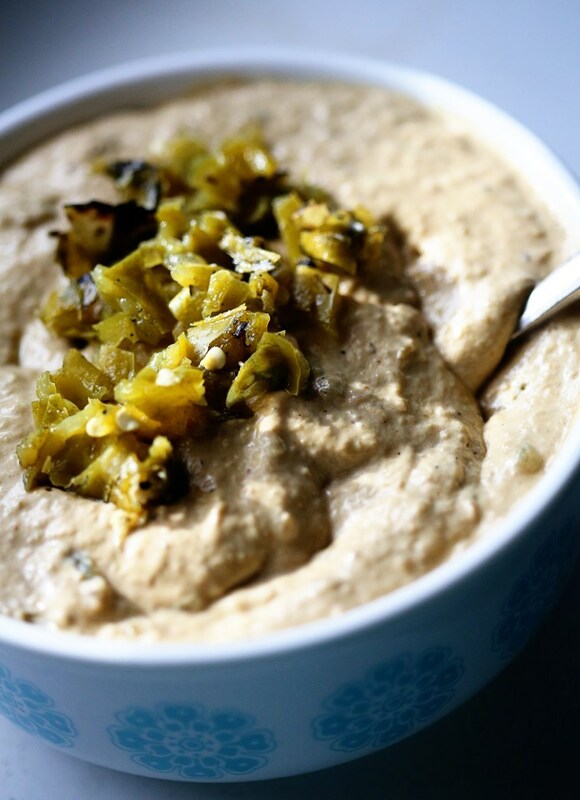 Today your recipe is a roasted green chile dip with caramelized onions. 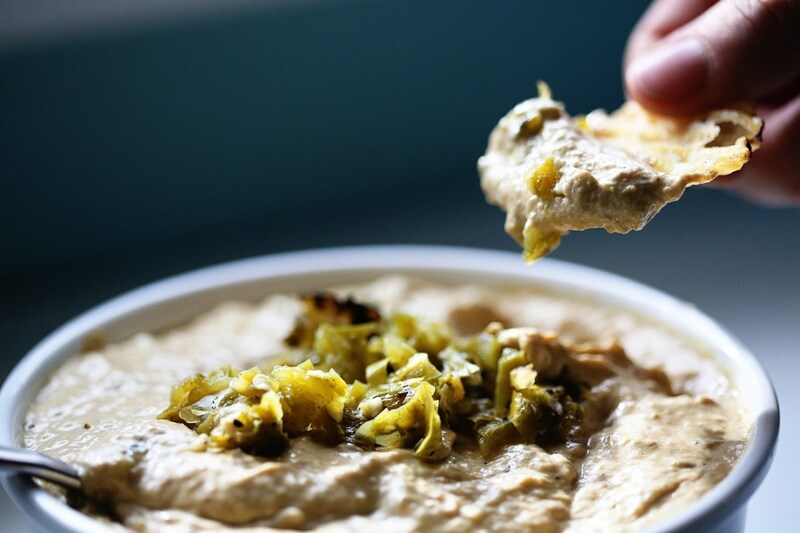 I posted about a caramelized onion dip last summer and I thought it would be the perfect base for adding some green chile magic. So here you go, my friends. Enjoy the first green chile recipe of the best week of the summer. 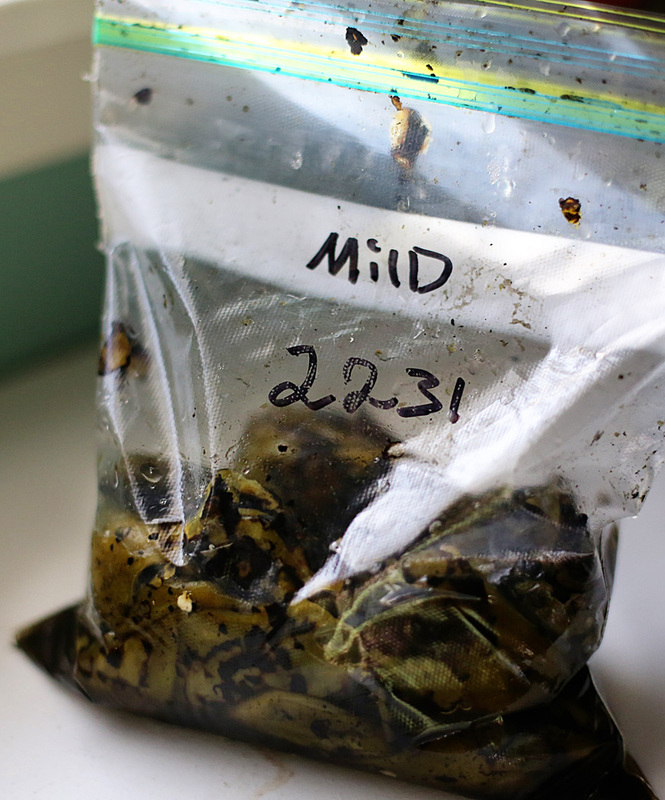 7-10 roasted, mild green chiles, seeded or not, it’s up to you. Meanwhile, in a food processor, add the cream cheese, sour cream, mayo and vinegar and a teaspoon of salt. Pulse until blended. When the onions are done, scoop them into the food processor and add the green chiles. I added just three at first, two seeded and peeled, and one whole, minus the stem. It wasn’t enough green chile flavor for me, so I just kept adding them. There are LOTS of amazing flavors in the roasted skins and since you are blending them up, it’s completely recommended to not peel the skins from your chiles when you add them. So! Add a few, pulse, and see how you like it. Add some salt, pulse some more. Add a few more chiles. Really, it’s up to your taste and what you like. We ended up adding 7 green chiles, 3 peeled and seeded and 4 whole (minus stem). It was a perfect heat level for us AND we were using mild chiles, so obviously, with the hot variety, you might want to seed all of them. I bought mild because I wanted LOTS AND LOTS of flavor without killer heat. This is a fun game of taste testing, so have some chips ready. Enjoy! 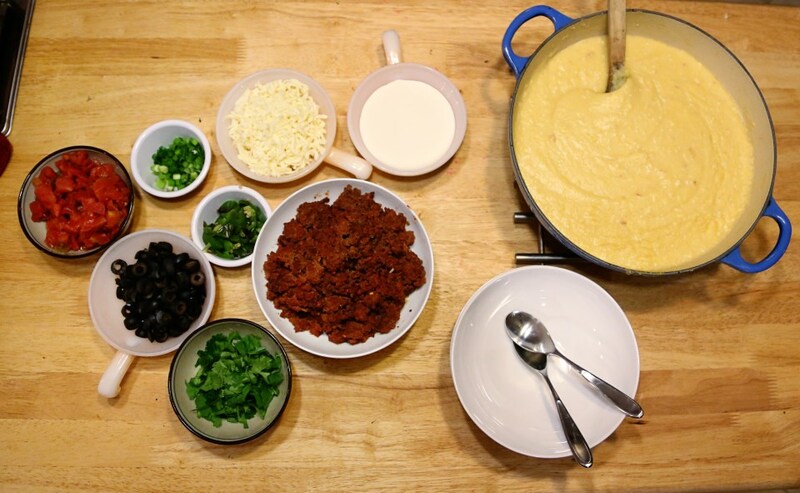 Superbowl Food – Nacho Grits! Super Bowl? Super bowl! Super good idea in a bowl. Nacho grits? Not yo grits! I’m done. You take all the things you love about nachos and you cook a big pot of grits (which are just liquid corn chips if you think about it) and you put out bowls and let people top their grits with whatever combination they love the most! Provide chips, too, because what jerk makes people crave nachos and then doesn’t have that as an option? Not this gal. After making all the toppings, I REALLY wanted super-cheesy nachos! But the nacho grits was an awesome idea, so we had to create it. And it was tremendously filling and amazing. For my bowl, I went with chorizo, black olive, scallion, shredded asadero cheese, Ro-tel, cilantro and Mexican crema. I incorporated cheese and garlic into the grits, so they already had that “nacho cheese” flavor. Really quite delicious! I’d recommend very small bowls for this magical side dish at the big game because it will fill your guests up very quickly! 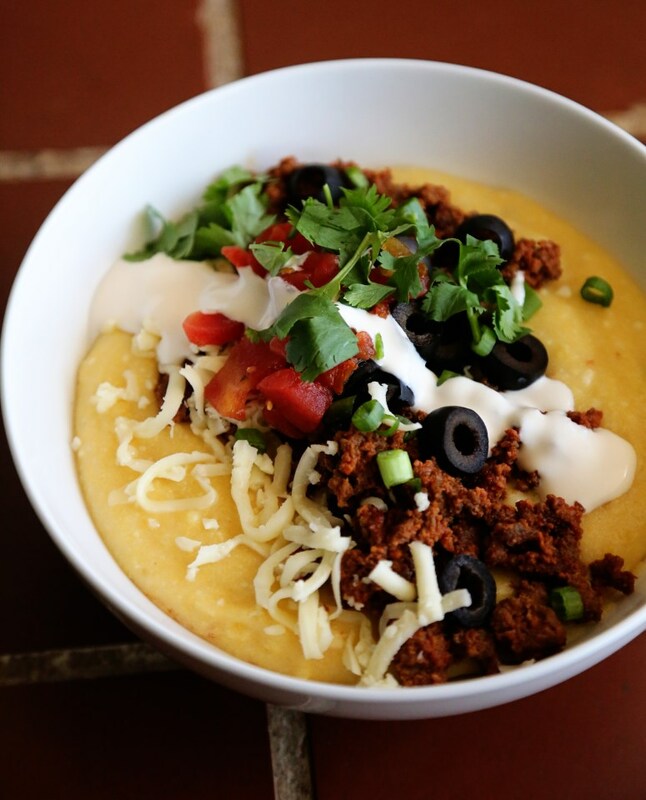 Click here to see my recipe for grits and let your imagination run wild with all your favorite nacho toppings! This is the best fried chicken I’ve ever had. We only make fried chicken about twice a year and when we do, it has to be this recipe. Crispy, light batter doesn’t overwhelm the chicken and it’s SO crunchy, you’d think it was double coated. Koreans know what they’re doing with fried chicken, and I think if you did this preparation to some chicken wings on Game Day, you would definitely be the hero of the hour. 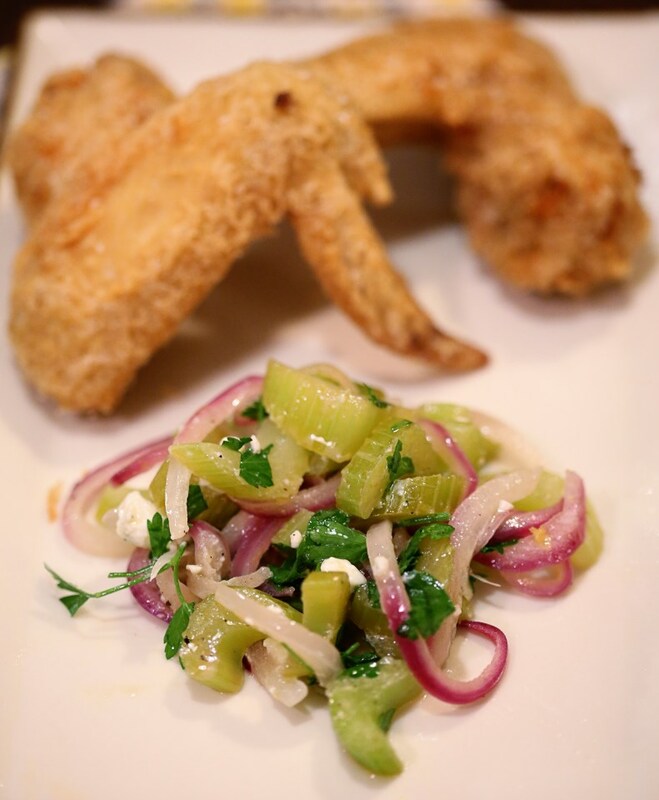 The blue cheese celery salad is an amazing side for the chicken. 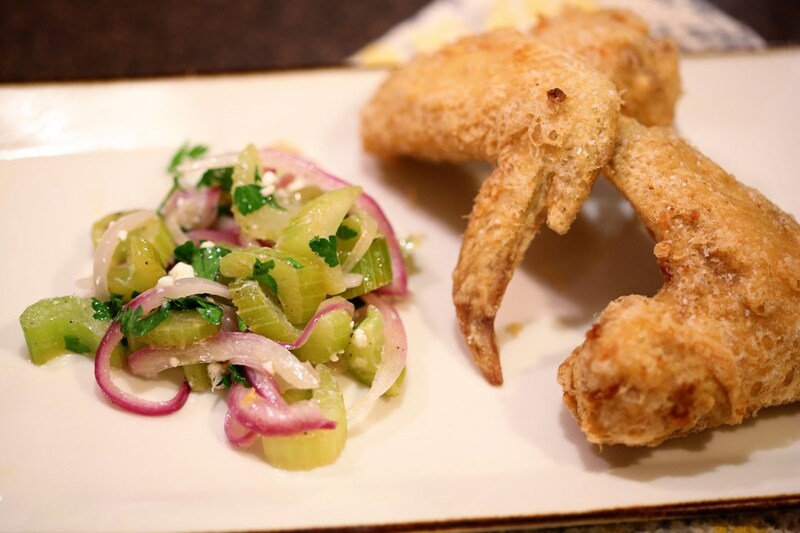 Crunchy and tangy and creamy – the perfect slaw/salad for fried chicken! Combine 2 teaspoons kosher salt, 1/4 cup cornstarch, and 1/2 teaspoon baking powder in a large bowl and whisk until homogenous. Add chicken wings and toss until every surface is coated. Transfer wings to a wire rack set in a rimmed baking sheet, shaking vigorously as you go to get rid if excess coating. Transfer to refrigerator and let rest, uncovered, for at least 30 minutes and up to overnight. 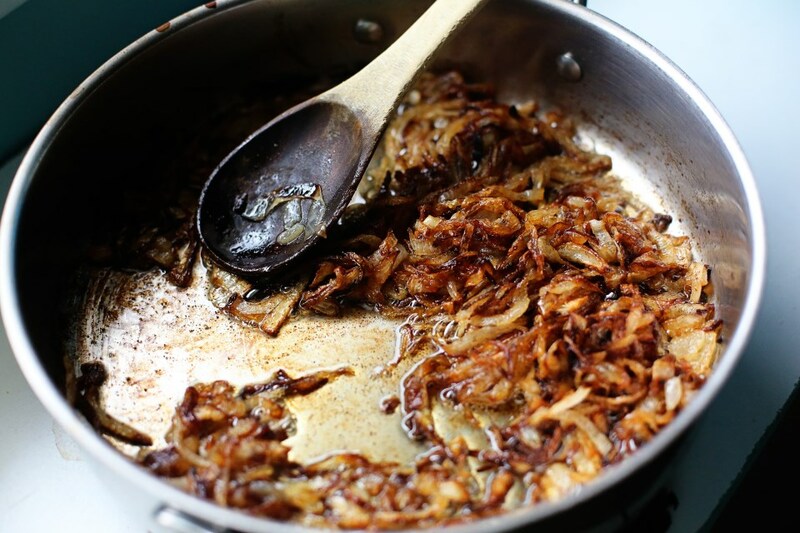 When ready to fry, preheat oil to 350°F in a large wok, Dutch oven, or deep fryer. We used a wok on the stove. Combine remaining 1/2 cup cornstarch, 1/2 teaspoon baking powder, flour, and 2 teaspoons kosher salt in a large bowl and whisk until homogenous. Add water and vodka and whisk until a smooth batter is formed, adding up to 2 tablespoons additional water if batter is too thick. It should have the consistency of thin paint and fall off of the whisk in thin ribbons that instantly disappear as they hit the surface of the batter in the bowl. Add half of the wings to the batter. Working one at a time, lift one wing and allow excess batter to drip off, using your finger to get rid of any large pockets or slicks of batter. Carefully lower wing into hot oil. Repeat with remaining wings in first batch. Fry, using a metal spider or slotted spatula to rotate and agitate wings as they cook until evenly golden brown and crisp all over, about 8 minutes. Transfer to a paper towel-lined plate and season immediately with salt. Keep warm while you fry the remaining wings. 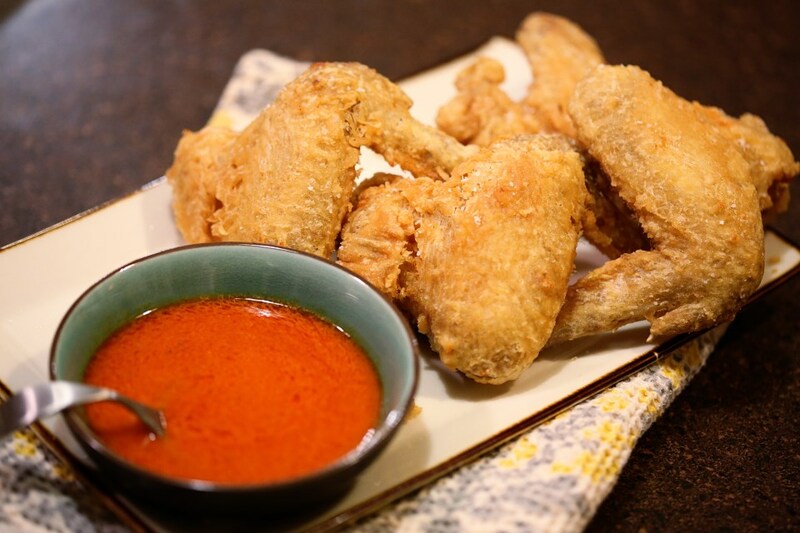 We dipped ours into traditional buffalo sauce, which we love. The chicken is so gloriously crispy that we didn’t want to totally coat it in sauce. Do as you please. The original recipe calls for a mighty fine sweet soy sauce that I highly recommend. In a large skillet, add one tablespoon of butter and saute the celery and onion until just beginning to soften, but still crunchy, about 5 minutes. In a large bowl, toss the parsley, vinegar, olive oil, lemon zest, salt, and pepper and whisk to combine. Fold in the celery, onion and blue cheese and serve!